Announcement Your cats will love Cattino and you'll love it too. Your cats will love Cattino and you'll love it too. Cattino Cat scratch pad play set. Includes replaceable scratch pads and cat nap hammocks. Easy to change Cat Nap Hammocks. Available in many styles, colors and prints. 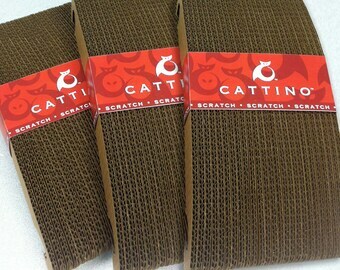 Easy to replace scratch pads make your cats favorite scratcher look like new again. Modern Cat Furniture that looks nice in any room. A few years ago after bringing Miss Trudy home… and after a few years of putting my design degree to “good use,” I finally got to the point where I could afford “nicer” furniture. What I found was, she loved it too. So I set out on the quest to find something else that she could shred. What I didn’t count on were endless amounts of carpet covered tubes, boxes and poles... My “Beer Budget” and “Champagne Taste” were confronted with products that matched more of a “PBR taste.” That’s when I decided to put my design degree to use for myself. With some help from a couple of colleagues, we came up with a few ideas, tested them on Miss Trudy and tested them again and again… and again. As everyone knows the job market tanked and the first people to feel a bad economy are the people in the design industry. My colleagues and I set into survival mode starting a design company of our own. Our kitty concepts went on to the shelf and our noses pressed firmly to the grindstone. A few years passed. Miss Trudy has her favorite chair. This past holiday season we tested a new version of our “Cattino” concept on Amazon. Miss Trudy approved. “Made in the USA,” more specifically Cincinnati. We hope to be building a ecommerce website soon, but we are always faced with “the cobblers kids always having no shoes.” We’ll get it there. Our goal is to: keep it “cool,” keep it local, keep it natural and keep it fun for kitty.